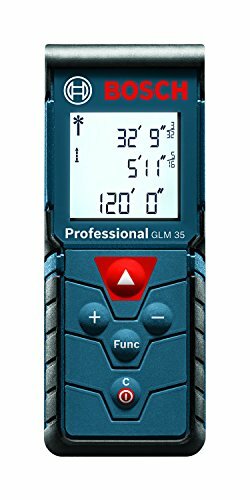 For this post, I have put together a collection of the best laser measuring tools available for purchase. No more dragging a tape measure across a room for a "close enough" measurement. These laser tools are typically accurate to 1/16" and give you an instant measurement with just the touch of a button. So if you are looking for a gift or something for yourself, you are sure to find the right tool for the job. So here is my list of The 10 Best Laser Measuring Tools. The Leica DISTO D2 New with Bluetooth offers improved functionality over it's former glory. Offering many functions like area, volume, two and three point Pythagoras, add/subtract, the D2 is a powerful tool in a compact, handheld device. Allows the measurements to be transferred into the free Leica DISTO Sketch app and many other apps through Bluetooth. Contains a Class II Laser with 1mW output. 1/16" accuracy and up to 330 foot measuring range. Bluetooth 4.0 for transferring measurements into desired software. Pythagoras function for indirect height or width measurements. Intelligent automatic end piece for hard to reach corners. 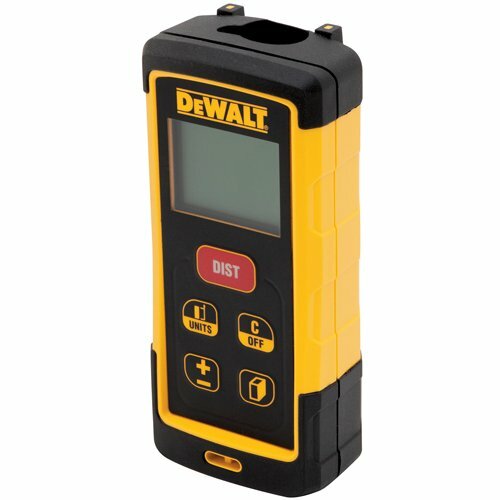 The DEWALT DW03050 165-feet laser distance measurer has the ability to calculate area and volume, making job estimates quick and easy with automatic calculations. Indirect height measurement uses Pythagoras to measure distances even when point A and/or point B are not accessible for linear measurement. Memory unit stores the last five measurements. 2-line backlit display helps improve screen visibility in both dim and bright conditions. Durable design featuring an over-molded housing and IP65 water/debris resistance. Operating range is up to 165ft with accuracy within 1/16 of an inch (1.5mm). Small doesn't mean modest in a laser measure with functions that include area, distance, length, volume, continuous measurement and addition/subtraction. Simply press the measure button to activate the laser and begin measuring in real time. Backlighting allows user to see information in dark areas with better resolution. Handy pocket-size design makes unit easy to use anywhere. Measures up to 120 feet. 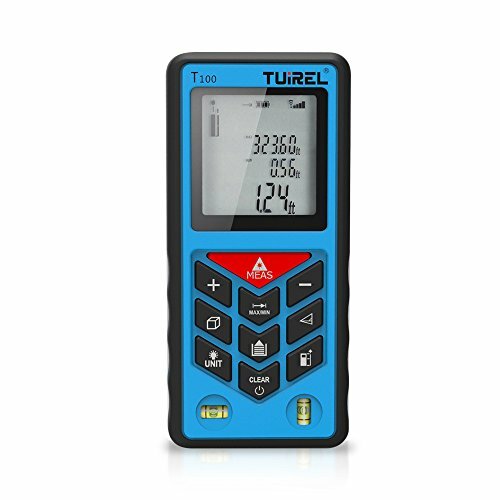 Utilizing precision laser technology, the Tuirel T100 laser distance measurer kit provides fast, easy, and accurate measurements every time you use it. Offers length, area, and volume measurements in inches, feet , decimal feet, and metric units. Continuous-length mode automatically adjusts your measurement as you move forward, which means you won't waste time taking notes and repositioning the tool. 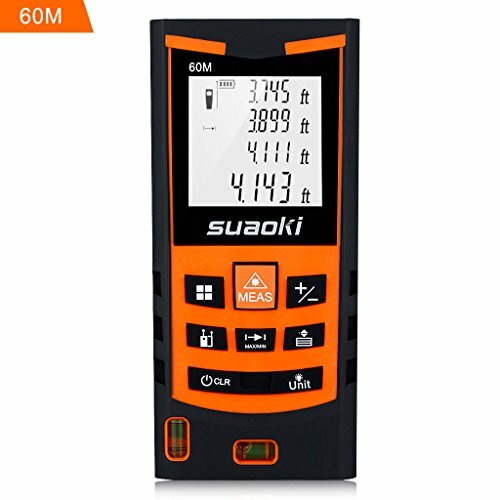 The Suaoki S9 Laser Measuring Tool has a measure range 0.05-198 feet; accurate to 1/16 inch and supports both imperial and metric units. 4-line backlit display which displays data clearly. Save and recall the last 20 sets of measure data. Single and continuous distances (min/max), area, volume. Pythagoras for height and triangular area. Reinforced rubber housing; water-resistant and dust-proof. 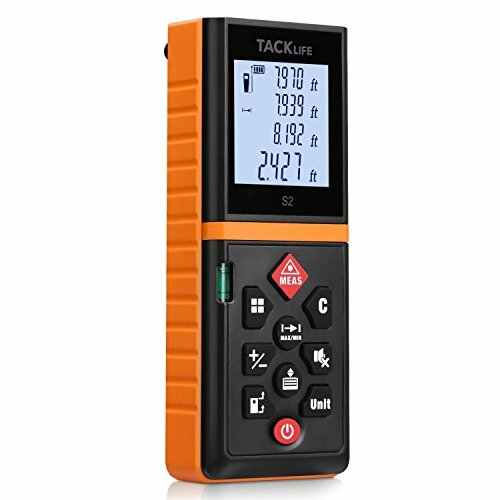 The Tacklife Advanced Laser Measuring Tool is accurate up to ±1/16 inch with a measuring distance up to 131 feet. Large LCD screen with backlight for increased visibility in low-light conditions. Area, distance, length, volume, continuous measurement. Low battery indication, 20 groups data memory. IP54 waterproof level and dust-proof function protect the tool. Mute setting allows you to turn on or off the beep. Portable size and hard rubber body provide a good grip. The ieGeek Laser Measuring Tool has a wide measuring range from 0.05 to 40m and features area, distance, volume, continuous measure, addition and subtraction, indirect pythagoras measurements. IP54 waterproof level feature protects the laser meter to the maximum extent. Comes with large 4 line LCD display with back light for increased visibility in low-light conditions. 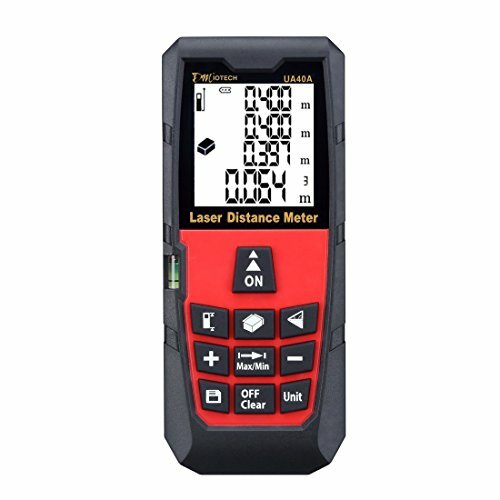 Easy targeting with bright laser pointer, the laser distance meter makes field work easier and more accurate. Compact size, handheld design, very convenient to carry. Non-slip material around the edges assures a solid grip and fast response buttons. Self-calibration accuracy from -9 to 9 mm. 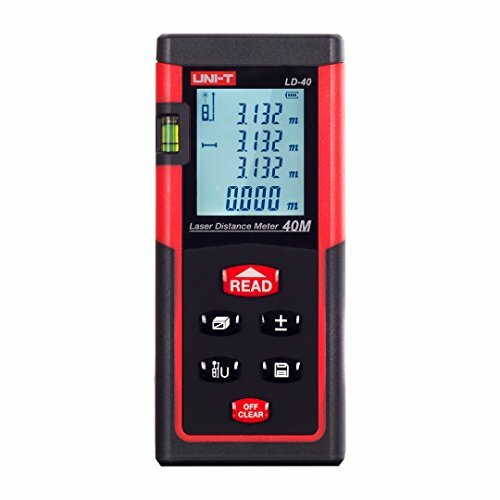 UNI-T LD40 Laser Measuring Tool Supports unit selection of meters, inches and feet. Handheld Laser Distance Meter 0.05 to 40m (0.16 to 131ft). Supports data hold and data clear function. 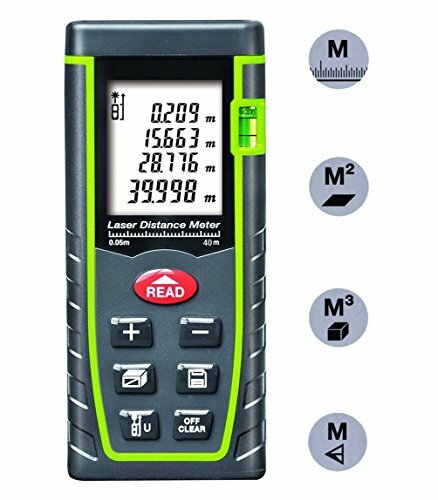 Supports data store/recall function of up to 30 measurements. Large LCD with backlight and multi-line display. 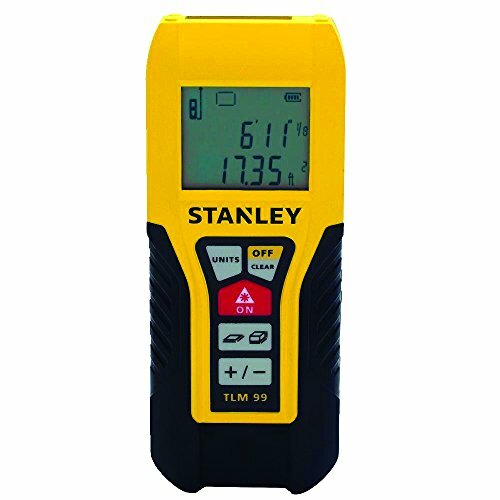 Stanley STHT77138 Laser Distance Measurer calculates distance, area and volume. Can measure a distance up to 100-Feet (30m), with accuracy of +/- 3/32-Inch (2mm). Continuous measurement tracking function finds distance from a target quickly and easily. Addition/subtraction feature is a convenient way to calculate in the field using standard measurement units. The DMiotech Laser Measuring Tool offers easy addition/subtraction of measurements with high accuracy and wide measuring range up to 40m. I hope this list has been helpful, if I left out a laser measuring tool you think is important, let me know in the comments below.